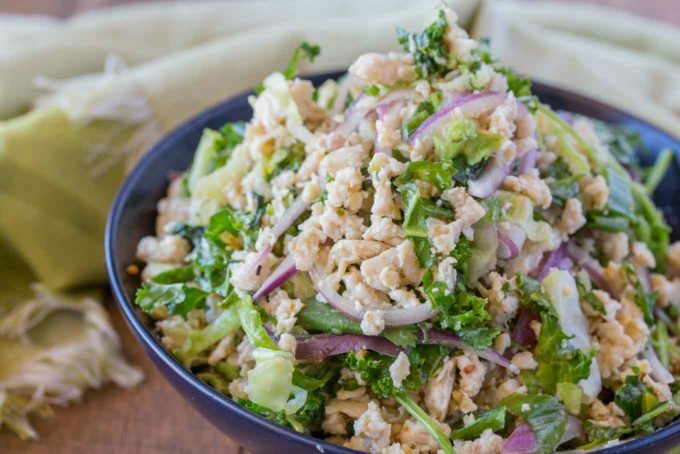 Thai Chicken Larb Salad is an easy, healthy chicken dish full of fresh, Thai, citrus, herby flavors. Also great served in lettuce cups! We love Thai food, especially healthy Thai Pineapple Chicken Curry and our other favorite Thai salad, Thai Green Papaya Salad. Thai recipes are fun an healthy way to enjoy Asian flavors with low points values. The use of fish sauce is usually the only hurdle in getting people to try Thai food who may be used to many Chinese and Japanese recipes. Fish sauce is a sauce made of fermented anchovies, salt and water. If you’re familiar with the flavors of pad thai then you’re familiar with the taste of fish sauce. If you’re concerned about the flavor being too strong you can also cut it back to just 1 tablespoon. I’ve added thinly sliced kale to this dish just because the green can stand up to the warm chicken and the dressing. It isn’t authentically Thai in any way but it adds great flavor and as a hearty green it would be great for adding bulk to the dish. 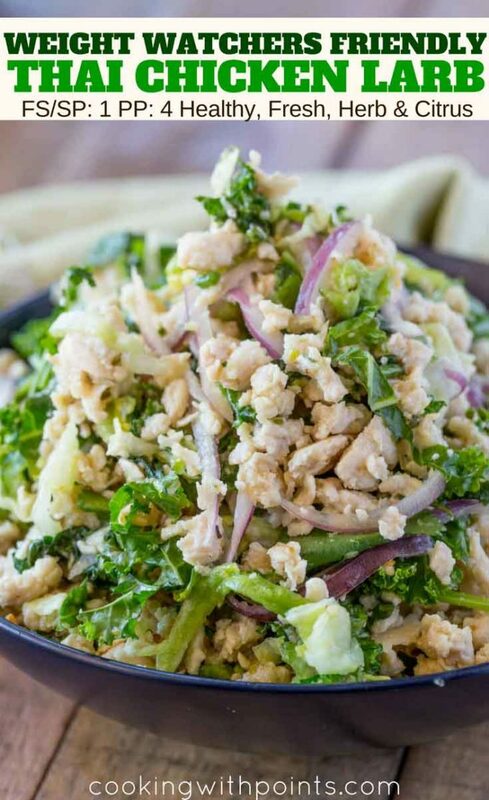 Chicken Larb is a Thai salad that is boldly flavored with fish sauce, lime juice, mint, cilantro and lemongrass. There is also usually onions in the salad, in this case both green onions and red onions. 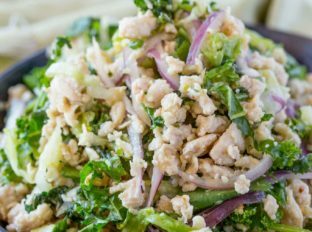 How do you make chicken larb? Ground Chicken is cooked with a bit of canola oil. Lemongrass, green and red onions are then cooked for just a couple of minutes before removing the mixture from the heat and adding in the fish sauce and lime dressing over roughly chopped mint and cilantro. 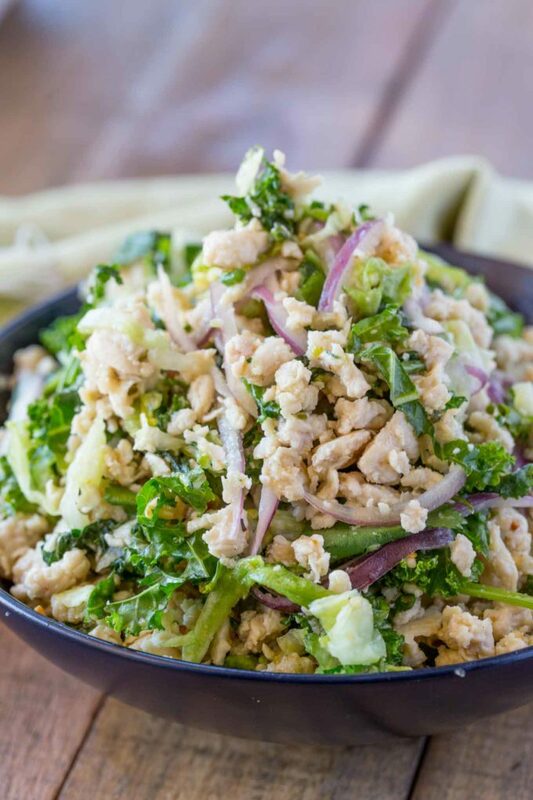 Larb is usually made with chicken but can also be made with ground beef, duck, fish, pork or finely minced mushrooms. You can also use a finely chopped firm tofu. Add the oil to a skillet on medium-high heat. Add the chicken to the skillet and cook breaking it apart. Once cooked through add the lemongrass, green onions, red onions and cook and stir for an additional 2-3 minutes. Add in the fish sauce, lime juice and chili garlic sauce and stir again. Toss with the mint leaves, cilantro, kale and bean sprouts. This sounds like it is so flavorful! Will have to try this soon! This looks so tasty! Full of flavor! You said chicken?! This will be my next dinner! This looks really tasty! I will definitely give this a try! I have never heard of this before. I am curious now and will have to make these! Looks delish! Bring on all the chicken recipes! I love this!